The wedding ceremony will probably be the only time in a woman’s life when the way she looks and feels is so closely identified with the flowers she holds. At the first the bouquet seems to be the most ephemeral part of the ceremony, but when the music announce the bride and the congregation rise to watch her walk down the isle, her flowers literally precede her. They help define her style, complement her dress, express the theme of the decorations, and can still be chosen for symbolic reasons, as they were in earlier time. Sometimes a bouquet incorporated plants that herbalist believed would fortify love or bring luck to the bride and groom. Design a bouquet can require delicate and elaborate technical skill, but it can also be as simple as gathering flowers and tying them with ribbon. Passionate gardeners might arrange their wedding to take place at the best moment for a particularly glorious border, from which the bouquet can be plucked. But generally, choosing the components of a bouquet require more thought than using what is in bloom. 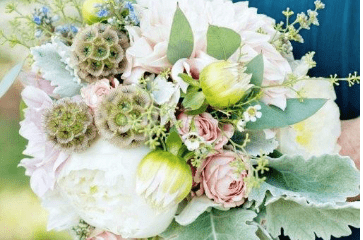 People recognized the allure of flowers even before there was a word for beauty, so it is not surprising that bouquets are an integral part of the weddings. The gown sets the mood, but a bouquet can underscore it. A formal dress suggests a more structured bouquet, perhaps roses with a ribbon cascade. A casual afternoon wedding in a striped tent is a natural setting for herbaceous border flowers like lilies, peonies, lisianthus in a bouquet that looks casually arranged. Color, pale to brilliant; size, from nosegay to cascade; shape, symmetrical or loosely gathered; these are the principal ingredients to coordinate.